Liza Sutton, Community Gardens Director, Christina Dedora, farmer, and Erika Rumbley, Community Gardens Network Coordinator, building a new raised bed at the Glenham Community Garden last fall. Today was the Women in Agriculture conference at the University of Rhode Island Narragansett Bay campus. It’s a fitting time to hold the event, as International Women’s Day was earlier this month. The Community Land Trust’s own former Director of Operations and current Urban Edge farmer, Christina Dedora, helped to run a breakout session on tips for beginning farmers at the conference; we’re so proud that she was there to share her knowledge and experience with others. As this article from the Environmental Working Group shows, women have been leading and continue to lead the way in the field of sustainable/organic agriculture as independent farmers, community organizers, policy experts, and the heads of both regional and national organizations, including our own executive director Katherine Brown. In our upcoming spring newsletter, you can read about Chia Xiong, a long-time community gardener-turned-farmer who sells her locally grown produce through our marketing collaborative. Kudos to all of these strong and successful women role models. In addition to the Plant Providence workshop on lead and soil health, there will also be a garden build-out in Olneyville this weekend! The Manton Avenue Community Garden, an active member of our Community Gardens Network, is relocating to a permanent home in nearby Joslin Park. Their new garden was designed by Community Land Trust board president and landscape designer Louis Raymond. This Saturday, the folks from Manton Ave. will need lots of volunteers of all ages and skill levels to make the move happen! If you want to participate in a great hands-on project that will help neighbors grow food, come out from 9 am to 1 pm to help fill raised beds with soil at the new site (rain date is April 9th). Wear comfortable shoes and work clothes; gloves, tools, and water will be provided. Questions? Call Jessica Vega at Olneyville Housing at 351-8719, ext. 104. 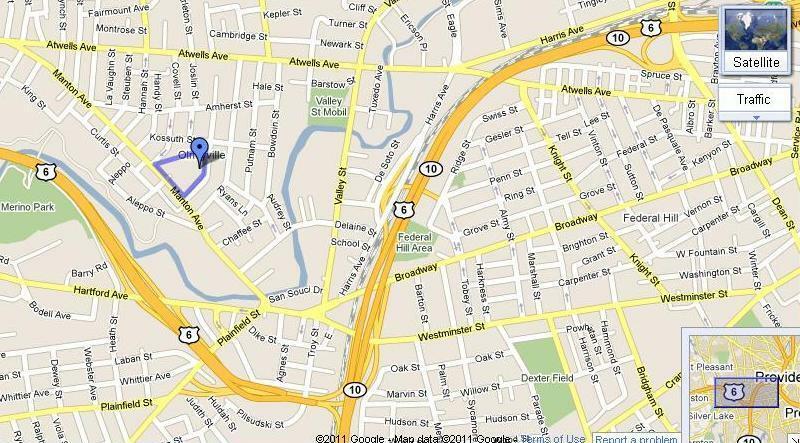 Joslin Park is located on Florence Street in Olneyville—click here for a map. The original garden build-out in 2005. The same garden just a few years later, bursting with flowers and food! Safe Soil: Remediating Lead for Healthy Gardens, the latest free workshop in the Plant Providence series, will be offered on Saturday from 10 to 11 am. Click here to get more details. Thank you to everyone who joined us for a special peek at the City Farm greenhouse last week! As late-season snowflakes fell outside, people delighted in seeing the bright green seedlings growing steadily inside in preparation for the Annual Plant Sale (less than 7 weeks away!). Afterward, they enjoyed refreshments and remarks during a cozy reception at Friendship Cafe, where founder Deborah Schimberg and executive director Katherine Brown shared the history and vision of the Community Land Trust. All in all, a great start to the spring. The cinder block bed cover dusted with snow this morning. For three years now, we’ve been growing early and late season greens in our cinder block raised bed, which is on an old cement patio at City Farm. The design is meant to be mobile (you can disassemble and reassemble it without too much effort), inexpensive (cinder blocks are cheap or easy to find), and flexible (it can be set up on a driveway, sidewalk, or patio and expanded or contracted as needed). You can also paint the outer surface! 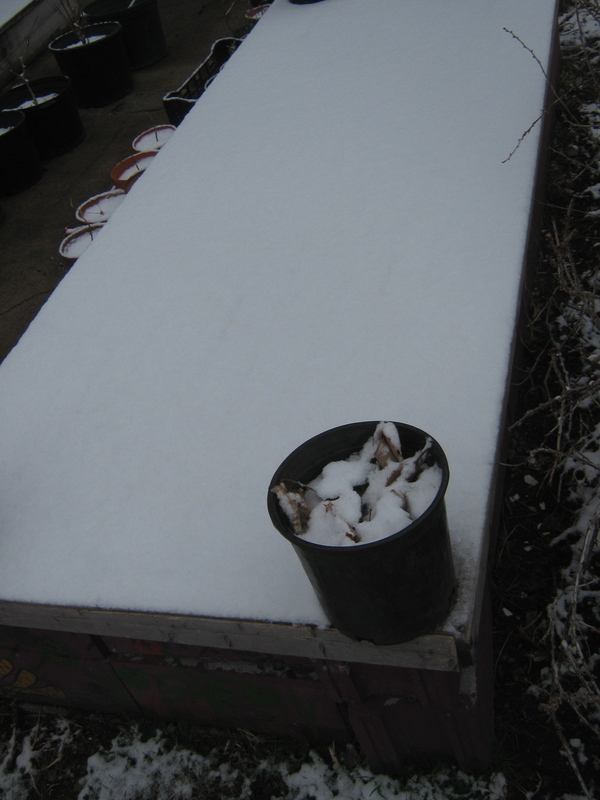 This morning, in a reminder of winter, snowfall settled on the cover of the old greenhouse plastic protecting the young starts. The insulated greens inside are cold-hardy varieties (claytonia, arugula, spinach, cress, mache, and tatsoi), which were planted (after adding compost) about three or four weeks ago (I usually plant them in the middle of January, but this year the cinder block bed was covered in deep snow for a longer period of time). A view of the cinder-block setup with greens. The insulated walls of the cinder blocks are full of earth, which helps to keep the plants warm. 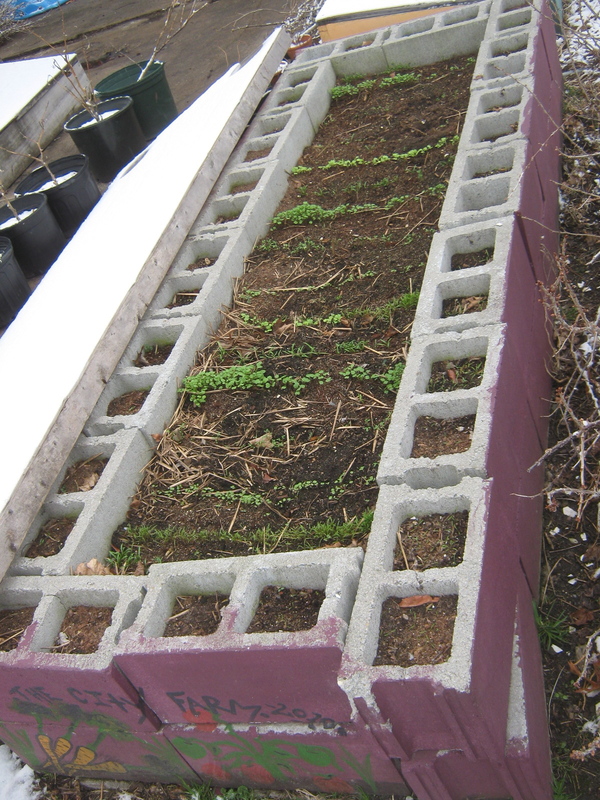 These outer blocks are planted with dill, beets, and more spinach. As the season progresses, the greens in the main area will be harvested and replanted with warm-season crops (last year it was hot peppers, basil, and kale). After these have run their course, we will put down some more compost and plant it again for a late fall crop or let it go fallow until the spring. This has been a productive bed for us over the years, especially in the colder months. These greens will probably be ready for eating in two weeks or so. This time last year, we were harvesting nice little salads from this micro urban growing area. Yesterday’s compost conference at RISD’s Chace Center was a resounding success, demonstrating the broad base of support that exists across the state for municipal composting of organic food scraps. The challenge now is to make it cost-effective and to forge the necessary collaborative partnerships. We are proud to be involved with this initiative, and we would like to commend Greg Gerritt of ECRI for taking the lead in organizing this inspiring conference. For a good recap of the event, check out ecoRI’s coverage. You can also download a copy of Greg’s remarks by clicking here. Out of the office and into the field: Christina is in her element at the farm. Last week, we said farewell to our longtime and beloved Director of Operations Christina Dedora. However, we couldn’t be any happier with Christina’s change of career. That’s because she has left the Community Land Trust to become a full-time farmer! We are thrilled that Urban Edge Farm, our incubator farmland available for low-cost lease to aspiring entrepreneurs, has launched another successful small-scale farming business in Rhode Island. The farmers at Urban Edge make decisions collaboratively, and Christina has been a wonderful leader there. Rich checks out Asian greens that survived the winter under the plastic and floating row cover. 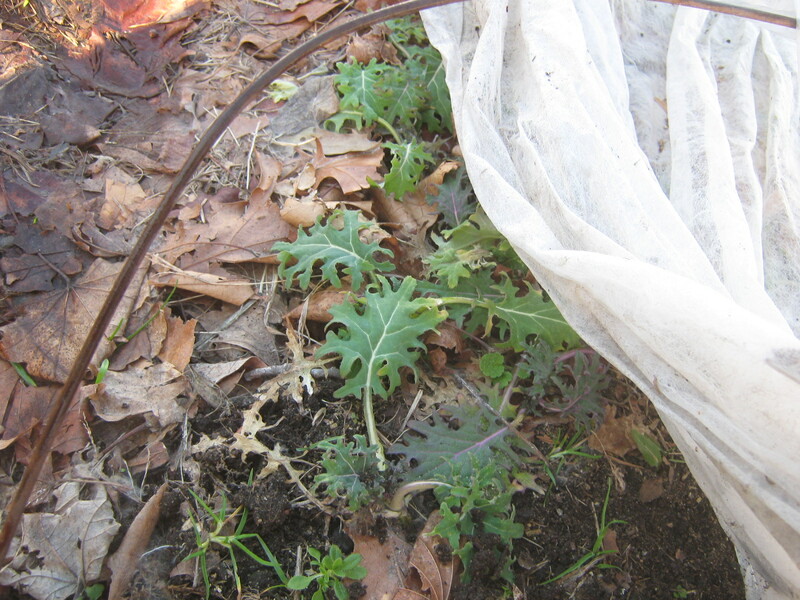 Two weeks ago, the kale was under a blanket of snow. Now it's time to watch it grow! 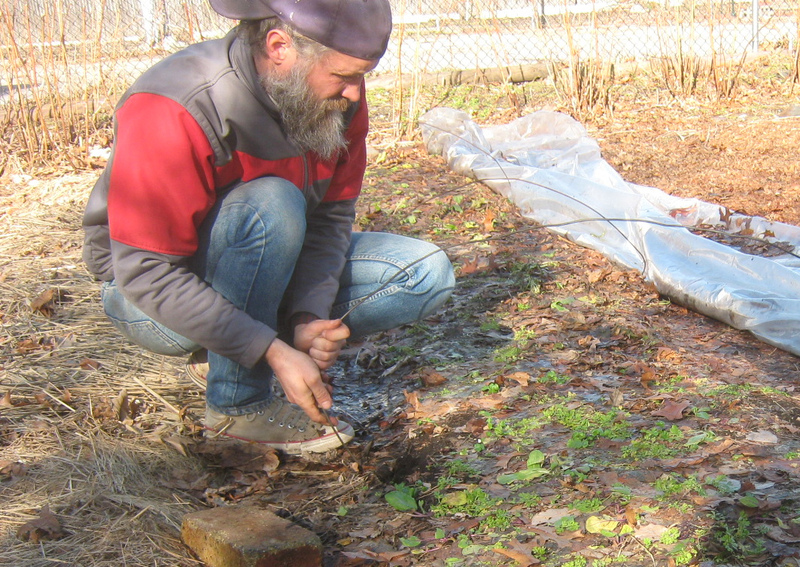 Last week, City Farm Steward Rich Pederson, assisted by Providence College work-study student Peter Kyller, pulled back the floating row cover and plastic that had been sheltering fall-seeded greens at City Farm. Look at what was waiting for them. Using this system is a great way to extend your fall harvest and get a jump-start on the spring. The cover of the newly designed newsletter. We are proud to reintroduce our print newsletter, Southside Green! Over the winter, the newsletter underwent a full makeover thanks to our talented freelance designer, Amanda Snyder of Soak Design. At last, it has emerged like a crocus for the early spring. The result of Amanda’s vision is a beautiful, fresh look with full-color photos on glossy pages, yet one that still feels warm and down-to-earth. Beyond the design, another change you’ll notice is the newsletter’s length: you’ll find that it’s shorter and more “digestible” now. This first issue of 2011 spotlights the Community Land Trust’s 30th anniversary this year (hurrah!) with a look ahead at upcoming events and celebrations. It also includes a feature on our transformative City Farm apprenticeship program and a story about our partnership with the Davey Lopes Recreation Center, a community center in our neighborhood. We hope you enjoy reading! If you’re on our mailing list, you should be receiving a copy in your mailbox soon—if you haven’t already. We’ll also be posting a PDF of the newsletter on our website. We look forward to bringing you news about the 2011 Plant Sale and an inspiring profile of a community gardener in the next issue. To make sure you continue to receive the newsletter, become a member of the Community Land Trust this year! We’ll be sending out a letter about membership soon, or you can visit our website to sign up now. Thanks for your support of our work. Erika Rumbley, SCLT's Community Gardens Network Coordinator (left) and Rich Pederson, SCLT's City Farm steward (right), recently met with representatives from Rhode Island Resource Recovery and AgResource to examine their compost. Many cities across the country have implemented municipal composting programs to divert food waste from overburdened landfills and reduce greenhouse gas emissions. By composting organic material, we can accomplish these goals and at the same time produce high-quality fertilizer that improves soil health and productivity. With a Community Food Project grant from the USDA, Southside Community Land Trust has been supporting a compost initiative in Providence spearheaded by Greg Gerritt of The Environment Council of Rhode Island (ECRI). Our Community Gardens Network Coordinator Erika Rumbley has also been sourcing a supply of compost generated from collected yard waste by Rhode Island Resource Recovery for community gardens and members of the Providence Community Growers Network (right). Now, we are proud to be partnering with ECRI, ecoRI.org, and RISD to put together a conference to explore ways to institute a large-scale composting system for food scraps in the state. It will be held Tuesday, March 22nd from 1:00 to 4:00 p.m. at Metcalf Auditorium in the Chace Center at RISD (20 N. Main St.); to register, click here. The conference will bring together state and local officials with representatives from industry, institutions, non-profits, and the hospitality sector. Anyone with a stake or an interest in composting in Rhode Island is invited and encouraged to attend. Confirmed speakers at the conference include Angel Taveras, mayor of Providence; Michael O’Connell, executive director of Rhode Island Resource Recovery Corporation; Janet Coit, Director of the Rhode Island Dept. of Environmental Management; Michael Merner, owner of Earthcare Farm; Reese Howell, president of Orbit Energy Inc.; and Michael Bradlee, vice president of Ecotope. To read more about the conference and municipal composting, see these related stories from The Providence Journal and ecoRI or this comprehensive white paper developed by Greg.